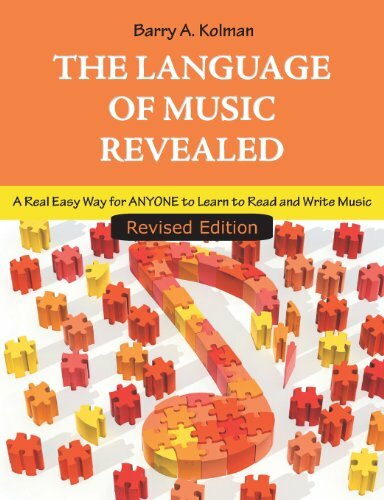 Barry Kolman describes his useful, well-written book as: “a real easy way for anyone to learn to read and write music.” While I don’t agree that those skills are easy to attain, this book is a good text that makes the subject anything but dry. Part I, which begins with the staff, the clefs, and the names of the notes, goes on to more difficult matters in a sequential manner. There are a few exercises and tests for each chapter, but any student would need a great deal more practice to become proficient at the skills involved. It would be good if there was an accompanying workbook. Since there is none, it is up to the teacher to augment the work supplied for skill building. Most of the important facets of music theory are covered here, and this book does allow the beginner to get an understanding of music theory from which he or she can progress to mastery. When the second chapter introduces sharps and flats, it uses the theme from the movie Jaws as an illustration and tells the reader that the intervals in that tune are half steps. That kind of thinking helps maintain the learner’s interest. For each topic there is a cartoon-styled guide that explains the aspect of music theory with which that particular chapter deals. Each chapter also has a section called “Fab Vocab” that singles out the new words that each student needs to memorize. After explaining sharps and flats, Kolman goes on to deal with major and minor scales, but the learner will only be ready to absorb it after having fully mastered the accidentals. Part II is devoted to the discussion of rhythm and its notation. It explains and illustrates every aspect of the duration of notes, from tied whole notes to the intricate tails of swiftly passing 64th notes. The reader also learns the meaning of time signatures. Part III introduces the study of harmony with a rock singer as a guide. The rocker plays chords and tells us that they are special triads consisting of the root, the third, and the fifth. Since they can be visualized as resting on top of each other, the following dialogue is attributed to them: Fifth: “Wow! I can see Kansas from up here.” Third: “Will you kindly get your elbow out of my eye?” Root: “Call Weight Watchers … you’re breakin’ my back!” Kolman’s inventive writing keeps the material interesting. Chords and chord progressions bring up the finale along with an explanation of cadences, but that really isn’t the end. There are all sorts of helpful appendices in this book. They explain musical form, major scales, and the relative minor for each. There is also a fully fleshed-out version of the “Fab Vocab.” The last appendix contains numerous exercises and their answers with the usual remonstrations about the honor system. I find this book to be useful for adult beginners and suggest that music teachers keep it on hand. Even advanced students sometimes need a few pointers and exercises on music theory.